Yes, I’m being selfish. And it doesn’t bother me in the least. I miss him, but I would never wish my sweet puppy soulmate back into the suffering he was enduring at the end of his life. Even though I know that he is happily zipping around in nonphysical, I do selfishly miss his little body zipping around here in my house. I miss my little Joy Boy. I miss hugging him. I miss his kisses. I miss his gruffly dreams while he is sleeping. I miss his smiling eyes when we put his beads on him. I miss him playing with his favorite ball toy. I miss his supervising all that happened in the kitchen. I miss his happy barks in the car. I miss everything about him. Buster was in every part of every day of my life for 15 years. He was my child. What a wonderful gift I’ve been given these last few weeks, too, though – folks, who could see and who understood my pain of loss, bravely and compassionately stepped up to tell their stories … validating, uplifting, and reassuring. I’m not sure what I would have done without your care and kindness. You see, I’ve never been through something just like this before. How do you tell the world that your dog was as precious to you as a human child born to a mother? Is that crazy? I’m finding that I’m way not alone. And it’s not crazy. I’m grieving this loss – not to try to hold on to what was – but to try to make sense of what is now. And, surprisingly, I’m getting to know and understand myself better in the process, clarifying even more what is truly important in life and realizing that I have zero desire to be around anyone who belittles someone else’s pain, because no one can truly know another’s pain. “It was just a dog – not like he was a human child.” Really? “Do you know what atrocities are going on in the world, and you are crying over a dog?” Really?? Well, yes, I’m crying over my dog, because it was unfolding in my living room, in my arms, in my heart. Everyone has the same right to work through their personal pain – whatever it is – and should be able to do so without ridicule. The goal is always to move to a better feeling emotion; we all just get there in our own way and time. Now, I believe and know that all beings are infinite and eternal, part of All That Is, and that there is actually no such thing as death as we usually think of it. All of our loved ones are continuing. The trick is to get passed the “but they’re not here beside me anymore” part. So, yes, I am wishing that I could hold Buster, right this minute. But, you know what? I’m okay with this selfish desire. I’m okay with reminiscing some, putting all of his photos in order, doing posts in facebook about him, keeping his favorite toys and blankies, letting his bed stay where it is, sharing stories about him, crying now and again and again …. The truth is that I know his essence is around me. I can feel him. I’ve seen a few flashes of him. The trick to this grieving thing is this: don’t grieve for the rest of your life and don’t stop living your life; instead, honor your loved one by living your best life and use what you learned about love with them to love even more for the rest of your life. Once I stop crying so much, I intend to do just that. I know for a fact that I’m a better person because I was Buster’s mom. What an honor and privilege. The essence of Buster will forever be a part of me, as I am a part of who he is, too. All of our lives have intersected, haven’t they? That you have read this brings you into the circle, as well. There is no separating. There is only allowing and continuing. Blessings to all. Love to all. Joy to all. Peace to all. Hope to all. Posted on September 17, 2015, in Uncategorized. Bookmark the permalink. 16 Comments. You said, “How do you tell the world that your dog was as precious to you as a human child born to a mother? Is that crazy? I’m finding that I’m way not alone.” Yes, you are not alone. I totally feel all the things you have written here. I am so sorry you have had those ridiculous things said to you. All I can say is, people who don’t know how to love/honor every type of living being, people who think one type is more important than the other…they are still missing a piece of what “love” is. People who do not realize that our “pets” are as equal as the human family/friends, they are missing a piece of what “love” is. In fact I grieved and hurt more when my kitty baby died than my human family that I have lost so far. I was looking online for why I felt more…because to me all are equal. And someone explained this so well. He/she wrote that the love you get from a pet is so uncomplicated, so free from ego, so unconditional, that no human is capable of loving in that way. Every human relationship has the complexity of personality differences, clashes, complexities, ego, beliefs etc. But an animal doesn’t care about those things. When an animal loves…the animal loves. That’s all. You can do what you want to, believe what you want to, be what you want to, your animal family STILL loves as much. In fact no one else can be as forgiving as them. So it is only natural to hurt so much when you lose that kind of love. A human can tell you “I love you” a million times. But you go against their beliefs, their wishes, and you have every chance of being booted out of their lives….with all their promises of love gone :). When an animal says, “I love you”, that means…love forever, no matter what. Please never any attention to anyone ridiculing you. Losing Buster is probably one of the hardest thing you have faced or will face. It will hurt like crazy. But yes, we will go on. And learn to live happily too, with their memories forever in our hearts. I too still have all of Billi’s stuff still lying around. Even the whole subcutaneous fluid set up is still hanging on my door. I cannot remove it now. I don’t know when I can. Right now I know I cannot. My son is still young enough that he can see spirit…and he sees Billi hanging around us often like nothing ever changed. I talked to an animal psychic to communicate with Billi and she said the same thing — that he knows he is “dead” but it doesn’t really make any difference to him, and he is living with us like nothing ever happened, and is very aware of our deep connection. Much love to you dear Nancy. Beautiful piece and dedication to your baby boy! I honor the love you had for him and man, he was a lucky pup. Cry, laugh, sob, celebrate, reminisce – whatever! Do whatever feels right for YOU. This is your journey, your life, and I honor every beautiful part of you. You and Buster were so blessed to have one another. He is looking at you now with those beaming smiling loving eyes of his so proud to have called you mom. 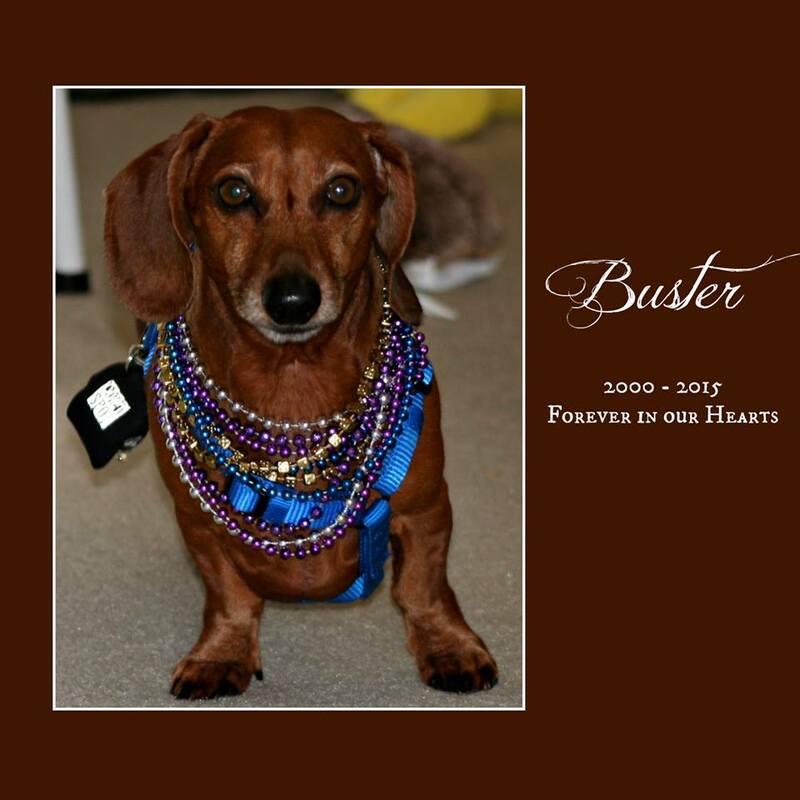 Buster, I know your spirit is free and all around but you are so missed. The love and trust that is given by an animal we love is a precious gift and when the pet has passed we are left with such a sadness but after a bit we know we were so lucky to be blessed with so much. Wings around us all. Aileen. What a beautiful tribute Doc ❤️ There is no love like that for a child. I have 2 human and 2 canine children. I have had to say good bye a few times and it never ever gets easier. My thoughts and prayers are with you. May you heal and know he misses you just as much.